Have you been thinking of updating your interior or exterior window treatments, but you aren’t sure where to start? 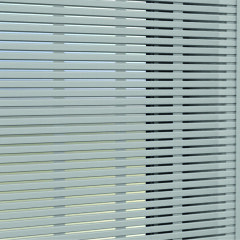 InSync Solar window treatments offer cutting edge technology with unparalleled aesthetic appeal. This line of exterior shutters has been designed to look amazing in any window frame, and the shades come with an array of convenient and innovative features. The following post will detail the 5 benefits of the InSync Solar TT10 line of shades and why it comes highly recommended as one of the top window treatment trends of 2015 from our product research. Watch as we give a video introduction to these truly unique exterior shutters. 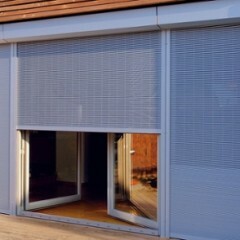 The technology makes these shades far different from the types of exterior shutters that people have used in the past. Each feature of this awe-inspiring product will lend a look and feel of futuristic style to your home. The various features have been implemented to match the needs of today. These shades are easy to manage, and they consume minimal space. Once you use these window coverings in your workplace or home, you will never go back to using traditional shades. Motorized blinds and shades are a lasting window treatment trend because they provide consumers with quick access to the level of light they desire. The slats are 10 millimeters wide, and they can be adjusted to suit your preference at any given moment. The slats close from the bottom to the top, so you may close the bottom part and leave the top slats open. This allows natural light to filter in beautifully without exposing a room to an overwhelming degree of light at certain times of day. The power feature also enables you to choose the degree of security you want at any time of day. When you leave the room or building, you can close the shutters completely by just pressing a button. During the daytime hours, you can open or close the slats depending on the level of privacy you seek. Once nighttime arrives, simply press a button and close the shutters entirely for the night. The slats shut so tightly that they are actually watertight; this means that they also offer you total privacy and security when they are closed. These shades are thin and sleek, but that doesn’t mean that they are weak. 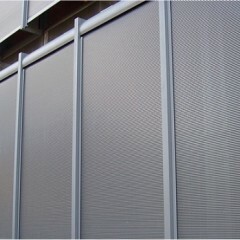 The InSync Solar TT10 window treatments are made of aluminum, which makes them extremely durable. They resist water infiltration, and they are strong enough to decrease the overall solar heat penetration to your building. Because these exterior rolling shutters are as tough as they are elegant, they are a highly cost-effective option for your home or office. Another benefit of using power options for motorized blinds and shades is that you no longer need to manage shades operated by a string or cord. This feature offers greater aesthetic appeal that you and your guests can appreciate. However, the motorized control function also provides you with a child safe advantage. Child safe window treatments may give you a peace of mind that corded shutters never can. You need never worry again about a little one becoming entangled in or choking from the cords of your window coverings. A truly exceptional window treatment system should provide you with versatility and customization – and that is exactly what the InSync Solar TT10 shutters offer. 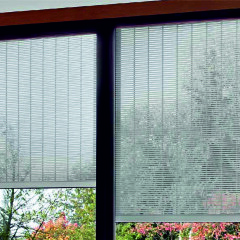 You can choose whether you want these motorized window treatments to be wired or operated wirelessly. You may also customize the colors to meet your needs and preferences. 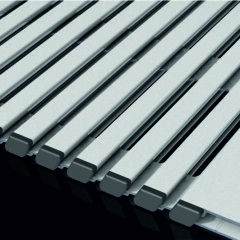 The slats are also available in a variety of widths, as well. Once you experience the InSync Solar TT10 line of exterior rolling shutters, you’ll likely wonder how you ever managed to accessorize your windows without these shades. They look sleek, modern, and elegant, and they are the perfect treatment option for any kind of window. The shutters are child safe, so you never need to worry when children are near them. You choose the level of light and security you want from the InSync Solar TT10 shades. These are the window coverings of the future, and they are available to you right now. Please contact us today to find the perfect treatments for your home or office. If you have questions about the InSync Solar TT10 or any other window treatments, feel free to call us at 858.452.6100, or set up an appointment. At 3 Blind Mice Window Coverings Inc., we are delighted to show you how our extensive line of window treatments can enhance and beautify your home.